After some much needed beach life on the Costa Daurada, I decided to head further down the Eastern coast. From North to South Eastern. It took a back breaking 4 hours to reach my final destination in Spain. I could hardly walk when I stepped off that bus. But wow, was it worth it when I hit Valencia! The Ciudad de las Artes y las Ciencias. Basically an arts zone with museums, galleries, aquarium, planetarium, oceanarium, zoo & a whole lot more. The place was great. I scouted it out for a bit, then made my way to the city centre. Seriously though, very, very hard graft! But I made it & what an impressive city I had waiting for me to conquer;) I managed to book a room surprisingly easy. So that was that. Time to explore the wonders that this place had on offer. 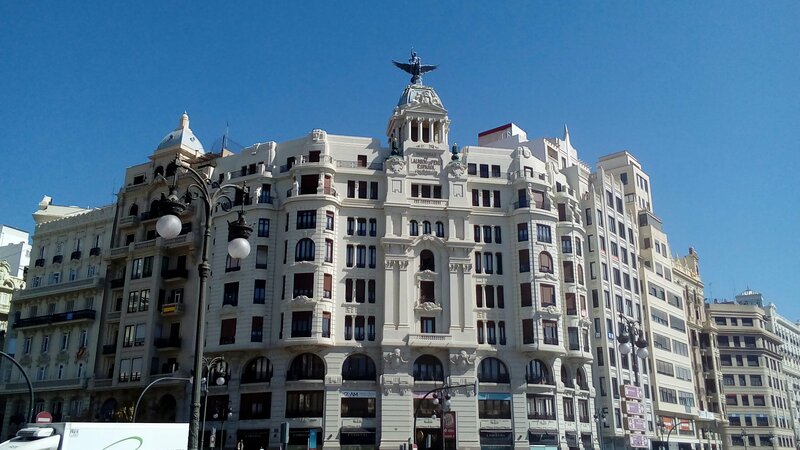 The magnificent city of Valencia is a port city that lies on Spains Southern Coast. Its known for its City of Arts & Sciences. The 3rd largest city in Spain & the capital of the Autonomous Community. & what a fascinating city Valencia is! I planned on going inside both, but when I seen the size of the queue around the corner, there was no way I was standing there all day. So I decided to visit the Ruins of the Roman City. I enjoyed this area of the city & chilled there for a while soaking up the sun & admiring the beauty of the place. The ruins date back to 138 BC & was founded as a Roman Colony called, Valentia Edetanorum. The architecture in Valencia is nothing short of fantastic & I enjoyed walking around admiring 1 after the other. The Round Square. Where all adjoining streets led to. There’s bars, cafe’s & restaurants here, with lots of entertainment. So obviously this was my favourite spot. The city of Valencia was amazing & I enjoyed my stay. I definitely plan on visiting again sometime in the future. Sadly that was the end of my travels down the Eastern coast of Spain. It was time to pack up & head back home with a heavy heart, as well as a heavy backpack. I’m a little dissapointed that I didn’t travel to Murcia. But hey, its made me plan for next time, to start in Murcia then travel back to Valencia then on to Seville & finally Madrid. So that will be fun! For those that haven’t yet visited Valencia. I would strongly recommend the city to anyone & everyone. Its simply fantastic! Thanks. Its a fantastic place & I’m definitely going back. The architecture is 1st class. I was more than impressed with Valencia. Amazing place! I wish I was there. Thanks for sharing. It really is Ultimate & I’ m definitely going back. It was the highlight of the trip. ← Sun, Sea & Sangria in Salou!